Realms of the Haunting was suggested to me last Halloween, and it seemed a good choice for the PC slot in this year’s festivities. But I must admit, I wasn’t sure what to expect going in; Realms is another genre blender in the vein of System Shock, and not the first person shooter you might expect from the screenshots. This is primarily an adventure game. You’re collecting items within the world and using them to solve puzzles, with some FMV sequences delivering plot along the way. If you’re familiar with the later Tex Murphy games, you’ll be right at home here – it’s essentially a gothic Under A Killing Moon. Rebecca’s the brains and Adam’s the brawn. The story casts you as Adam Randall, a regular schmoe who receives a package from his estranged (and now dead) father imploring him to come to his forgotten mansion. After reluctantly going, and having mystical forces lock you within (natch), you must explore the grounds for clues uncovering a plot involving multiverses, ancient prophecies, and The End Of The World. Along the way, you’ll pick up a psychic named Rebecca who follows you on your journey and offers her expertise as well as a sounding board for Adam’s own thoughts. It’s a plot that keeps you curious, and gives you a solid mystery to uncover. Again, though, I reinforce this is not a shooter. There are 20 chapters here, around 40 hours of gameplay, and a whole host of puzzles to solve and backtracking to… track. It also lives deep within its own fiction, with stacks of journals to read, parchments to scroll through, and a cadre of characters whose names you probably won’t remember. It’s important to know what you’re getting into – unlike, hypothetically, a person who thought he could bang this out in a week for an upcoming review series. The interface takes some adjustment, as the developers have tried to streamline it to something you can optionally play with only the mouse. 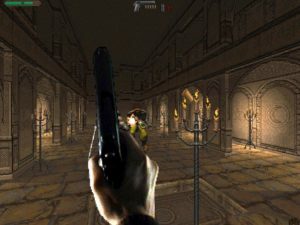 The game world is observed in full screen, and the mouse controls an ever-present pointer. The pointer uses a system of color codes to indicate when you can click on something within the world, and the action it will take – green interacts, blue asks you to move closer, red means you can shoot it. An eye indicator lights up when you can click the right mouse button to examine something. It’s complicated and unconventional at first, but again, you adjust. A bottomless inventory is divided into sections, filling up with weapons, notes, artifacts, and profiles of everyone you run across. The Tower realm links all others. Trouble comes when you’re asked to use or hold items. Objects are worn or consumed by picking the item out of your inventory with a left click, and then right clicking while it hovers (left clicking instead drops it in a new slot). Trust me – I never stopped forgetting how to do this. 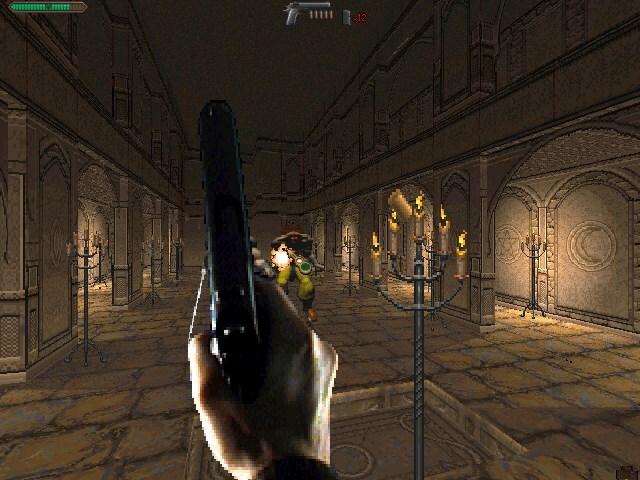 You have a left and right hand to drop items into, with the left (and left click) reserved for weapons. The right hand is for holding objects to use in the world, or to store the last object you picked up. Right clicking on inventory objects examines a CG render of them, with the same voiced observations for that item played every time. It’s worth noting here that there’s only one difficulty option, and it relates to “manual” or “automatic” item use. You switch between these with the F3 key. Automatic will use items such as keys when you click on the correct door with the correct key in your inventory. Manual mode requires you to dig through your inventory and actively place the corresponding key in the right mouse slot. Crucially, puzzle solving is never automated. In any instance where you have to lay specific objects with precision, or use an object on an arcane mechanism, you’ll have to deploy these yourself through the right mouse slot. Movement is handled either through the arrow (or numpad) keys, or moving the cursor to hotspots around the screen. The keyboard is highly recommended, especially because you’re going to need some real precision later in the game – more on that in a bit. You’re able to strafe with < and >, giving you a chance to slide out from cover and avoid any ranged retaliation. You can look up and down, and will need this to find some slightly hidden objects, or ammo placed inside 3D crates. Finally, you can switch to a “run” mode with the Caps Lock key, which is another handy option I didn’t discover until about halfway through. Hooray for unconventional systems! Realms certainly goes all the way with its gun animations. I say the game isn’t a shooter, but those guns aren’t for show either. 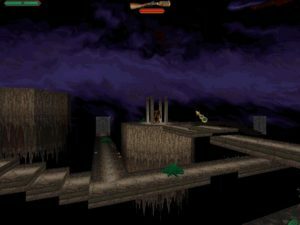 Throughout the game, extradimensional baddies will teleport in. You’re given a generous stock of ammo to deal with them, plus some weapons later on that recharge their own ammo. However, your fights are almost always strictly defensive, and never too taxing. The hardest parts come in recognizing when defeating a foe is part of a puzzle (like using a trap on an otherwise invulnerable creature), or when enemies will be infinitely respawning and you should run instead. Beyond that, most foes use melee attacks and none of them follow you through doorways. It’s easy enough to pick off any and all comers from the reliable safety of a doorway or platform. Fast-paced action this is not. FMV sequences are the final piece, triggered automatically to tell critical parts of the story. Some of these can last up to ten minutes, and many feature dialogue options that let you ask for extra clarification. Every FMV uses live actors filmed against a green screen, and the cheapness and campiness is undeniable. Still, everyone seems committed to their roles, and the scenes do work in service of the game’s complicated plot. Lip sync often slips, which is the only major disappointment. The length of these could also be a complaint, but really, you should understand what you’re in for by now. As said, the game is divided into 20 chapters, and in terms of progress, is a strictly linear tale. However, it’s built around a hub system you can navigate mostly at your leisure. The mansion is a sprawling complex with wings that unlock over time, on top of the four “Realms” of the title. Buried within the mansion are portals to a “Tower” realm – itself unlocking over time to access portals to the other universes. Unfortunately, this freedom really offers nothing practical except a chance to get lost. You make no progress until you find the next critical item or location, and barring the occasional ammo box or health potion, you get nothing by wandering. You’ll certainly see some sights in your travels. Realms certainly looks great, with sharp textures on the maximum 640×480 resolution. The mansion looks properly spooky at every turn, and the realms vary between blue-sky garden paradises and underground stone hells. A great lighting engine gives a mostly dynamic glow to your personal lantern, along with static candles that can be lit, and working light switches you can click on and off. 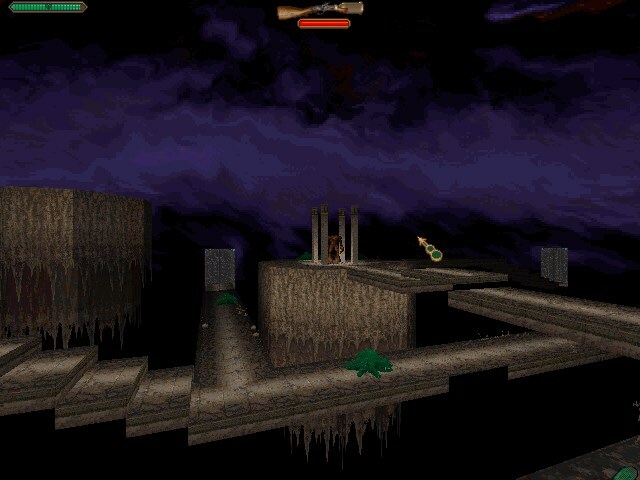 Levels have a nice verticality to them as well, with hanging platforms, multiple mansion floors, and plenty of stairs and pits to explore. The only flaw I noticed was that some rare walls warp their perspective as you approach or move away. When it happens out of the corner of your eye, at least, you get a nice “did… did you see that?” effect. As said, you’re going to be in this for the long haul, which is what is most likely to turn potential players off. You can’t rush this one, and even if you try, some devious puzzles are going to block you. There’s some inventive challenges here I enjoyed, like reading notes and combining items to perform rituals, or passing “tests” by using objects from one room to defeat unique traps in the others. 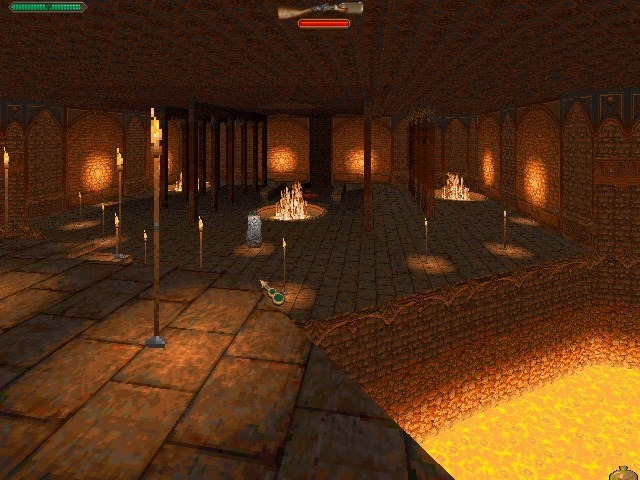 But there’s some real stinkers too – running around a stone maze looking for sixteen brains is pretty much my definition of video game Hell, and there are a few “rotate these switches” puzzles where I’m sure there’s a pattern, but I just clicked randomly until I was done. There’s also moments where you’ll need to hop among moving platforms, or jump over beams to avoid alarms – things that are never easy peasy from a first person view. Finally, it’s not actually that scary, which is a real disappointment for something with “haunting” in the title. There are no ghosts, poltergeists, or even jump scares. 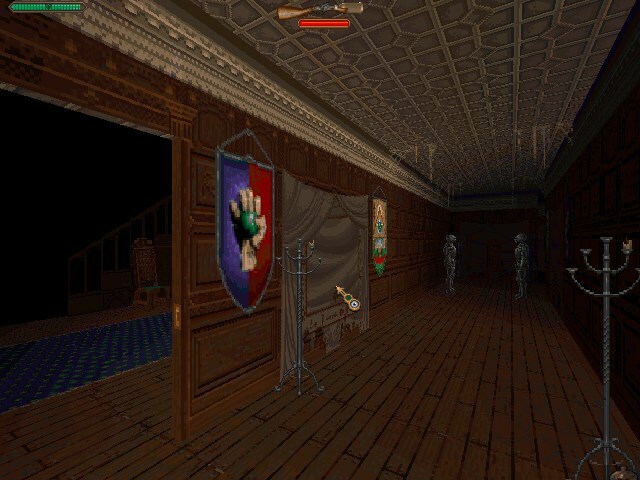 The mansion can be dark and creepy, but there’s never a real element of danger to create a sense of dread. The teleporting bad guys usually only show up after you’ve done something critical to the plot, and once handily dispatched, leave you to roam a silent mansion or realm until you encounter the next plot point. And overall, the whole show is less horror, and more close to an Indiana Jones vibe – if Indiana Jones took itself much more seriously. Oh well, it’s still a Halloween review. Overall, Realms is more creative than I expected, and a fine first person adventure. Comparisons to System Shock and the FMV Tex Murphy games are quite fair. You’ll need to be prepared for a long game, a fair amount of reading, and a plot that’s a little convoluted and daft. I could have done without the lengthy mazes and the more onerous jumping puzzles, but overall, there’s satisfaction to besting its challenges. Not a game for everyone, but a unique adventure for those interested. Great graphics at max resolution. Interface is complicated, but works well. Plenty of puzzle variety. Lots of content, if you’re prepared. Some backtracking, mazes, and precision first person platform jumping. Story is perhaps a bit too convoluted and cheesily dramatic. Not many scares here, despite the implication. NOT too scary for Rik? I don’t believe it. I always heard good things about this, but it took your review to tell me that a) it’s not a shooter and b) it’s quite long. Plus mazes and backtracking…ah, I’m kind of going off the idea. (Also it might still be too scary for Rik). Great work again on the Halloween special. I wish I could time some reviews to coincide with…something. Obviously takes some planning and organisation. Perhaps if I start now I could come up with something Christmassy. I also forgot to mention the only in-game maps are drawn on parchment items. You can’t have them open as you move. Further, they don’t fill the whole screen, so you have to grab the map and move it around within the window. Yes, definitely not a shooter. I actually DO have holiday review plans this year, but qualifying games are surprisingly hard to find. Daze Before Christmas remains the only flat-out Christmas game I’ve found. The rest are cute one-offs like Holiday Lemmings, or perhaps a game that happens to take place at Christmas. What about the game of It’s A Wonderful Life? Ok, so Christmas stuff is pretty thin on the ground. I guess the stuff I was thinking of had more tenuous links to the holidays. But we’ll see. 40 hours? Wut? I don’t think I spent even 20 beating this game (although I did take a peek in the walkthrough on a couple of occasions), and I certainly spent much more while TotalCarnaging either Marathon 1 or 2. Also, there IS strafing in this game, and with applying a fan-made “US version patch” you can both remap controls and change battle difficulty (although the game is still extremely easy even on Very Hard). 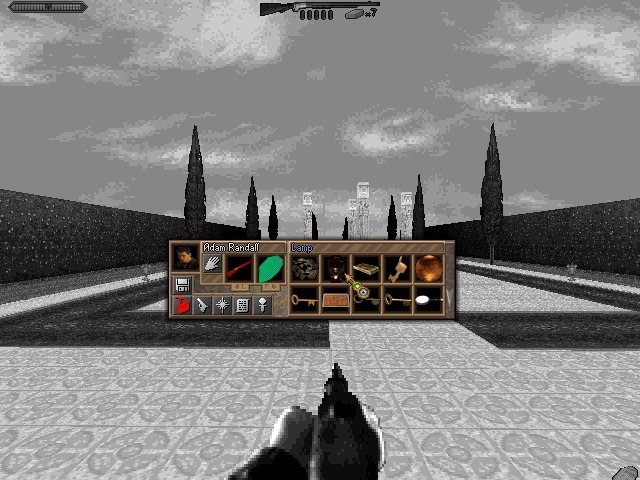 With the remapped controls (A and D for strafing, cursor keys for moving and turning) and keeping the cursor strictly in the center of the screen any time you aren’t interacting with the environment, you can play this game just like DOOM. Moreover, positioning your magical weapons in the inventory correctly, you can achieve tremendous speedup in the speed of combat while fighting (basically bashing the living hell of your keyboard “3->space-> 4-> space-> 5->space->6->space->3->space->4->etc.”-style) because while you fire one magical weapon, all the other weapons regenerate their magical energy. All the conventional guns basically become completely obsolete once you have at least 2 regenerating magical gizmos in your possession. Also, there are no endlessly respawning enemies in the game. You were probably talking about that skeleton gangbang in the first dungeon, but it’s actually possible to destroy all the skeletons out there with the staff (they resurrect if you take them down using conventional guns). It’s just that there are a LOT of them – but it’s still a finite amount. Also, the second half of the game was obviously created in a hurry. Also, some of the battle dungeons _suck_ (those gargoyle caves… ugh, and that alien-brain thing is indeed videogaming equivalent of hell). And in pretty much all the locations other than the mansion, there is WAAAAAAAYYY too much empty extra space. But overall I do agree with your score. I’d rate it the same way. It’s not an ideal game by far (I wouldn’t mind a level-designer who knew his stuff, for example) – and I was expecting a bit more (like, the narration, that’s not skewed and rushed in some of the moments from the second half of the game), but it’s certainly the best Gremlin game by far (especially when compared to, say, Soulbringer). You’re right! You can strafe with < and >. I should probably change that part. Good points on the rest. The second half did indeed feel rushed. Glad my observations held up to a fan’s scrutiny! Thanks for reading! I just bought this as part of GOG.com’s Linux launch. Looking forward to it! Also, I think it’s middle mouse button, or maybe both buttons, to turn on mouselook. Though it goes off once you release the key.